On November 25, 1863, Cpl. Josiah Davis of Company C was wounded in the right shoulder during the charge up Missionary Ridge. On December 16, 1863 Cpl. Davis died as a result of his wounds in a Chattanooga army hospital. Josiah’s wife, living in the Waveland, IN. area applied for a Federal Pension shortly after his passing. 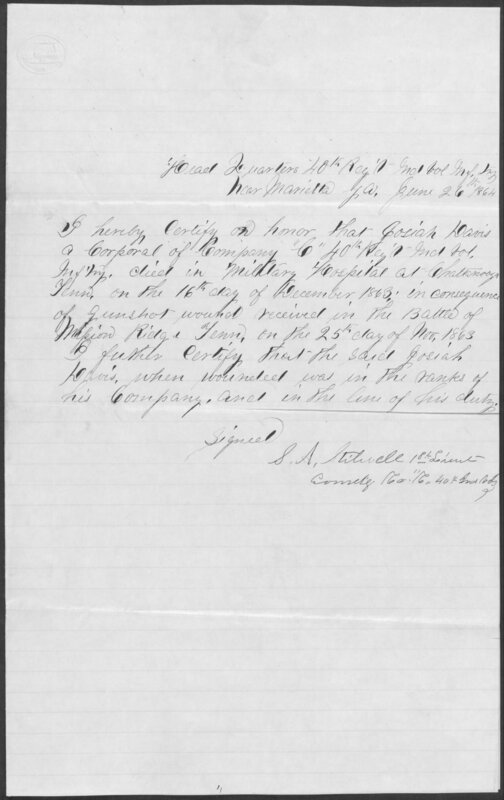 The letter below was written by Lieutenant S.A. Stillwell (Co. C), confirming to the pension examiner’s office that Cpl. Davis was wounded and died doing his duty. corporal of Company C 40th Reg’t Ind Vols. Mission Ridge Tenn., on the 25th day of Nov. 1863. Comdg. Co. C 40th Reg’t Ind. Vols. Six men from the Waveland area were killed as a result of the Missionary Ridge charge.Taylor McIntosh (Co. H), Cpl. Josiah Davis, Serg’t. William Galey, James Elrod, Lt. James Hanna, Cpl. Robert Hanna (Co. C) Josiah’s body was shipped home, as were three other members of his company (Hanna brothers & Galey), all four are buried in Freedom Cemetery, Montgomery Co., Indiana. This entry was posted on March 24, 2012 at 2:27 am and is filed under Missionary Ridge, Soldier Profile with tags captain stillwell, josiah davis, Missionary Ridge, Waveland Indiana. You can follow any responses to this entry through the RSS 2.0 feed. You can leave a response, or trackback from your own site.